The painters were in today, in force. We had about 5 of them on the job, as opposed to the 1 that we had last week. They really want to get the job done. 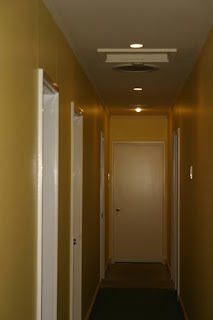 So they finished off the hallway which looks so much brighter in this shade of yellow, called Lemon Delicious. They also started in James' room which was a surprise. We came home to find James' bed all covered up in clingfilmy type of plastic that is to protect furniture from getting paint dropped on it. We got them to move James' mattress into the spare bedroom so now James is sleeping on a mattress on the floor. He thinks it is fun, so that is good because quite honestly I am so over this whole fire fiasco, I can't wait for this all to be over & done with.